Soup is good food, but Broccoli Cheese Soup is great food! As a kid I used to run around our house singing/screaming that slogan from the Campbell's Soup commercials. That just may be one of the silly things kids do, but in my case the sentiment really stuck as I still adore soup. When it's cold outside, few things make me feel as good as the smell emanating from a steaming bowl of heart warming soup. I'm sure many have been the times when you've still been so hungry after finishing a good bowl of soup that you say you could even eat the bowl. Well, have you ever had soup in a bread bowl? The first time I experienced it was as a kid at my aunt's house in Louisville and it just seemed so creative to me. 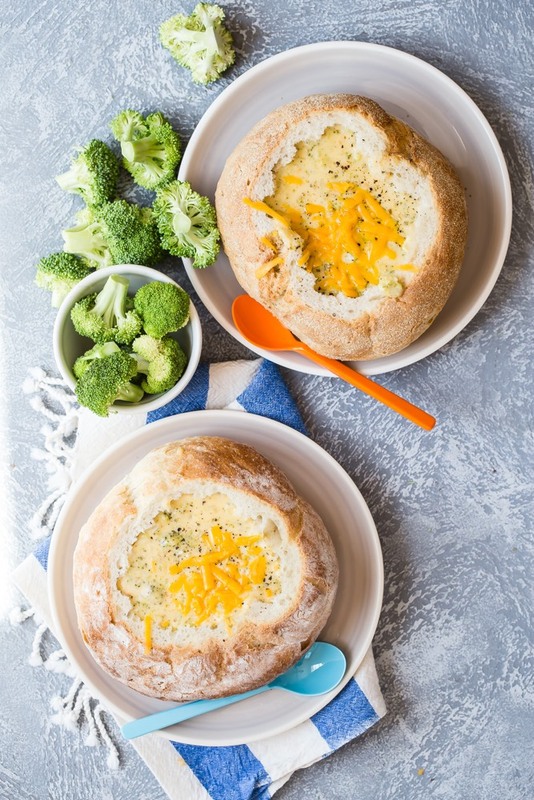 The concept of having your meal in an edible bowl can really be magical for a young eater, as I found out when I presented my kids each with their own bread bowls filled to the brim with soup. 1. In a large pot over medium heat, melt the butter. Add the onion and cook 3 to 4 minutes. 2. Sprinkle the flour on top of the onion, and use a whisk to work in the flour. Once it’s combined, cook the onion-flour mixture for 2 to 3 minutes. 3. Add the milk and half-and-half, whisking constantly until combined. 4. Sprinkle in the salt, pepper, and nutmeg. 5. Stir the broccoli florets into the soup. Cover the pot and reduce the heat to low, then simmer the soup until it’s thickened and the broccoli is tender, 20 to 25 minutes. 6. Stir in the chicken broth and check the consistency. The soup should be thick, but if it still seems too thick, splash in a little more broth. 7. Add the cheese and stir until melted. 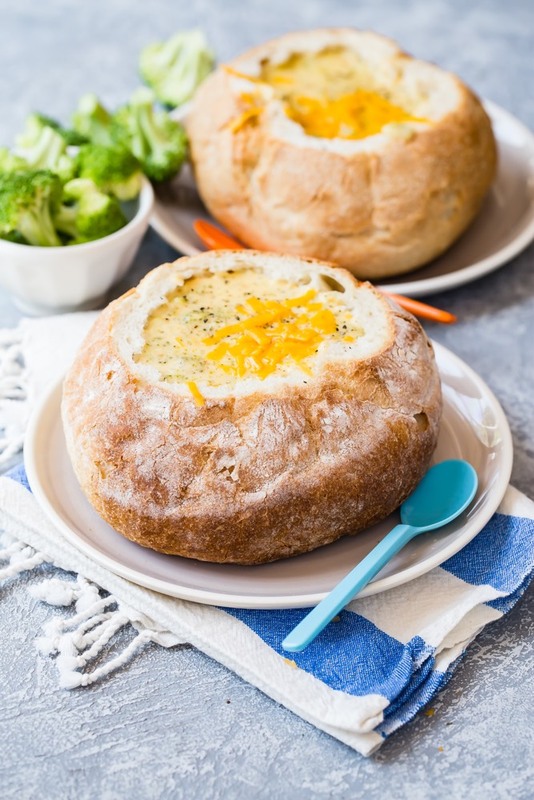 Serve the soup in bread bowls. NOTE: For a smoother soup, use an immersion blender to puree the soup before adding the cheese. Substitute pepper Jack cheese for a slightly spicier soup.